Maria de Boef Miara, Lecturer in Biology at Brandeis University, will be leading a course titled Bio-Inspired Design this summer (June 1 thru August 7, 2015). Bio-Inspired Design is part of the Justice Brandeis Semester (JBS). JBS combines courses and experiential learning to provide complete, immersive experiences so students can deeply examine a specific area of study. Bio-Inspired Design is designed for students from a wide spectrum of disciplines, but may be particularly appealing to students in Biology, Biological Physics, Environmental Studies or HSSP areas. This is a 10-week course providing 12 credits. Students in Bio-Inspired Design will spend the summer working with biologists, engineers and artists in a variety of settings. They will explore intriguing life forms and develop the quantitative tools needed to work at the intersection of form and function. The due date for applications is February 17, 2015, at 6:00 PM EST. The Division of Science wishes to announce that, in 2014, we will again offer Division of Science Summer Undergraduate Research Fellowships for Brandeis students doing undergraduate research. These fellowships are funded by generous alumni donations. The due date for applications has been changed: it is now February 28, 2014, at 6:00 PM EST. Division of Science Summer Undergraduate Research Fellowships will provide $5000 in stipend support to allow students to do summer research (housing support is not included). Students who will be rising Brandeis sophomores, juniors, or seniors in Summer 2014 (classes of ’15, ’16, and ’17), who in addition are working in a lab in the Division of Science at the time of application, are eligible to apply. A commitment from a Brandeis faculty member to serve as your mentor in Summer 2014 is required. The Division of Science Summer Program will run from May 28 – August 1, 2014. Recipients are expected to be available to do full time laboratory research during that period, and must commit to presenting a poster at the final poster session on July 31, 2014. 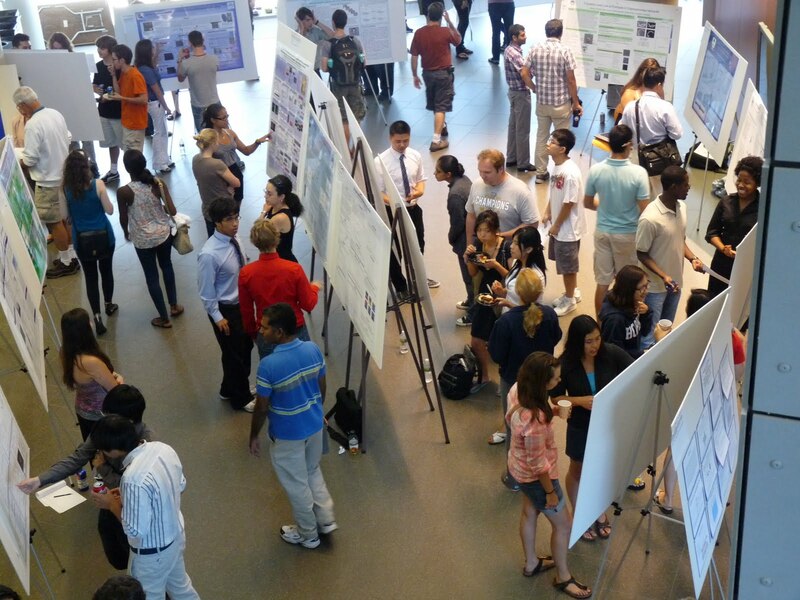 Brandeis Summer Scifest, an Undergraduate Research Poster Session, will be held on Thu, Aug 1 2013. 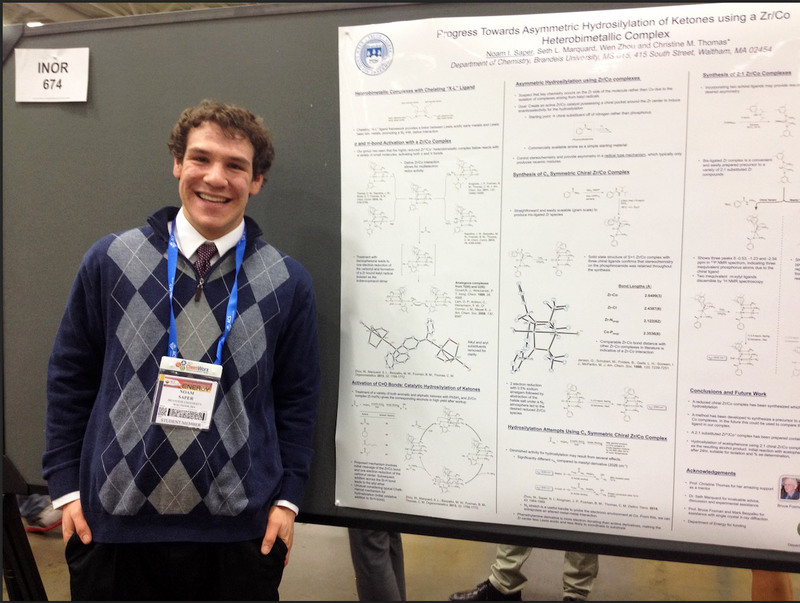 Undergraduates from laboratories and research groups throughout the Division of Science, including summer visitors and Brandeis students, will present posters on their research. The poster session will run from 1-3 pm in the Shapiro Science Center atrium. Update: Abstract submission has closed — the abstract book containing the abstracts of all 75 posters is now online. How does the brain decide whether you like what you eat? When we encounter a taste, we appreciate both its chemosensory properties and its palatability—the degree to which the taste is pleasurable or aversive. Recent work suggests that the processing of this complex taste experience may involve coordination between multiple brain areas. Dissecting these interactions help understand the organization and working of the taste system. The lateral hypothalamus (LH) is a region of the brain important for feeding. In a rodent, damage the LH, and the rodent may starve itself to death; stimulate it, and you get a curious mix of voracious eating and expressions of disgust over what is being eaten. Such data suggest that LH plays a complex game of balancing escape and avoidance, palatability and aversion, during the evaluation of a taste stimulus. Little is known, however, about how neurons in LH actually respond to tastes of different valences. Brandeis postdocs Jennifer Li and Takashi Yoshida. undergraduate Kevin Monk ’13, and Associate Professor of Psychology Don Katz have recently published a study of neuronal reponses in LH in the Journal of Neuroscience. They have shown that taste-responsive neurons in LH break neatly down into two groups–one that responds preferentially to palatable tastes and one to aversive tastes. Virtually every taste neuron in LH could be identified as a palatable- or aversive-preferring neuron. In addition, even without considering the specific tastes to which a particular neuron responded, these two groups of neurons could be differentiated according to their baseline firing rate, shape of response, and tuning width. While these neurons were spatially intermingled, several pieces of data (functional connectivity analysis, relationship to responses in amygdala and cortex) suggest that they are parts of distinct neural circuits. These results offer insights into the multiple feeding-related processes that LH manages, and how the hypothalamus’ role in these processes might be related to its connection to other parts of the taste system. Li JX, Yoshida T, Monk KJ, Katz DB. Lateral Hypothalamus Contains Two Types of Palatability-Related Taste Responses with Distinct Dynamics. J Neurosci. 2013;33(22):9462-73. 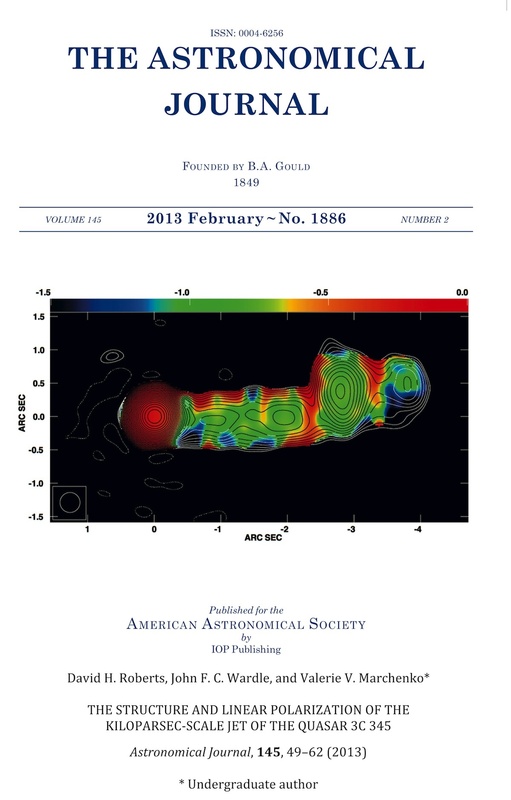 The editors of the Astronomical Journal chose an image from a Brandeis research paper to adorn the cover of the February issue of the Journal (see right). What is sweet about this is that the image was made by Valerie Marchenko, a senior physics major who has been doing research since her freshman year, initially with Dave Roberts, and presently with John Wardle in the Physics Department. Several of the images in the paper were made by Valerie, and of course she is a co-author. This is actually her second publication in a mainline astronomical journal. Roberts DH, Wardle JFC, Marchenko VV. The Structure and Linear Polarization of the Kiloparsec-scale Jet of the Quasar 3C 345. The Astronomical Journal. 2013;145(2):49. Brandeis undergraduates publish upward of 20 papers a year in scientific journals along with their faculty, postdoc and grad student mentors. The Division of Science wishes to announce the availability of Traineeships for Undergraduates in Computational Neuroscience through a grant from the National Institute on Drug Abuse. Traineeships will commence in summer 2013 and run through the academic year 2013-14. The due date for applications to the new programs will be February 25, 2013. The curricular requirements are listed on the program website. The application form is online (Brandeis login required).